Where would we be without the convenience of plastic caps and lids? A thoroughly modern invention, bottle caps are a must-have, something we cannot imagine life without. But in addition to the service they provide, they also bring some trouble into the picture. Due to their small size and varied composition, bottle caps raise a big stink among recycling centers. “Can you recycle bottle caps” has been the million dollar question for quite some time. Also, should you remove them or not when recycling? Today we’ll try to answer your ardent questions as accurately as possible. Before we can answer the inquiry in the subtitle, we must go back to the unwritten rules of the majority of curbside recycling programs. For years, green citizens were told to remove bottle caps before tossing any containers into the recycling bin. However, the Association of Postconsumer Plastic Recyclers (APR) has changed all that by claiming that plastic recyclers will start including the bottle caps in their recycling processes. In other words, that statement has just given consumers the green light on leaving the on the plastic bottles when recycling. But why wouldn’t you, in the first place? According to recyclers, the primary issue with bottle caps comes from the materials used. Most plastic bottles use polyethylene terephthalate (PET, or plastic #1) or high-density polyethylene (HDPE, plastic #2). By contrast, the caps are usually made of polypropylene (PP, plastic #5). In plastic recycling, different resins cannot be processed together. They have to be processed beforehand because they have different melting points. Therefore, caps and rings couldn’t go in with the bottle containers. So what changed? How come APR has changed the rules? Find out what else you can recycle. Other recyclers cite safety issue for not including bottle caps. If you leave the caps on the bottle, they might shoot off at impressive speeds when bottles end up crushed for transport. Not crushing the bottles with caps means transporting fewer bottles, because “air weight” takes up a lot of space. This is what APR did to get around these two major issues. The association encourages consumers to crush bottles before twisting the cap back on. At the same time, it asks them to send bottles to the recycling centers in a fit state. That means the containers must be fairly clean and free of liquid. Only some recycling centers require consumers to rinse the bottles. However, the APR wants you to keep in mind that even though plastic recyclers now process the material in caps, you should still follow the instructions of your city’s or state’s recycling program. At the same time, this rule changing does not involve glass bottle recycling. The majority of glass recyclers still request consumers to remove metal lids prior to recycling. The APR statement does indeed clarify the recyclability of caps. However, the agency believes the ideal situation would involve manufacturers using the same type of resin for both bottles and caps. While some city recyclers accept plastic bottle caps, they may ask you to remove the cap from the bottle bin it separately. If you’re not sure what the rules are in your area, you can try Googling “[YourCity] Plastic Recycling.” A lot of U.S. cities have set up their own websites with easy to access information. Is there no local place for you to drop off your plastic bottle caps? Fortunately, there are nationwide programs that can take them in. Caps Can Do, for instance, is a company that specializes in collecting and recycling #5 plastic. Check out the link and see if you’re viable. Also, Aveda has launched a recycling program in the U.S. called Full Circle. In line with its Cradle-to-Cradle® design philosophy, the initiative focuses on the concept of “zero-waste.” Aveda says the company’s ultimate goal is to eliminate waste, making a positive difference in the world. The packaging collected by Aveda will be sorted and recycled into reusable material. Then, the company uses the downcycled material for making new Aveda packaging or accessories. What a creative way of diverting plastic trash from the landfill! Place the can in the correct recycling bin and pat yourself on the back! Do you have other urgent recycling questions? Are you confused by the many online sources? We heartily recommend Earth911 and their database if you’re trying to figure out which facilities near you accept “plastic caps”. Of course, we mustn’t forget about the green mantra: “Reduce, Reuse, Recycle.” These three actions are sort of in order of importance. So, the ideal way to fight plastic bottle cap waste is to stop buying products in plastic bottles! Keep in mind that even if you can recycle those plastic bottle caps, recycling plastic is highly inefficient. Plastic is essentially downcycled, which means it becomes a lower grade of plastic. After several times through the recycling process, that plastic becomes of such poor quality that it heads straight to the landfill. As far as plastic is concerned, the recycling center is just a temporary stop on its way to the landfill. Use cork foundations to set a collection of bottle caps painted in coordinating colors. Voila, you have the cutest crafty coasters for your beverages! 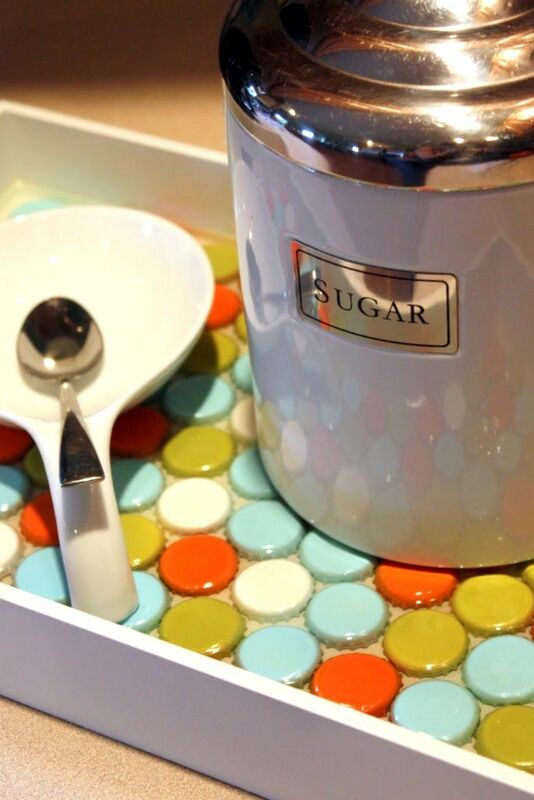 If you’re sick of your plain white tray, line it with painted bottle caps for a retro vibe. 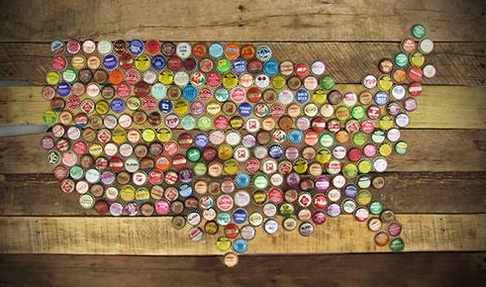 Use a rustic wooden backdrop and your collection of bottle caps to map out the United States. Bonus points if you can match brewery destinations with their geographic locations.